Kicking off the New Year, The Growler Guys – SE Portland will launch the new educational series with its Brewmaster’s Series. 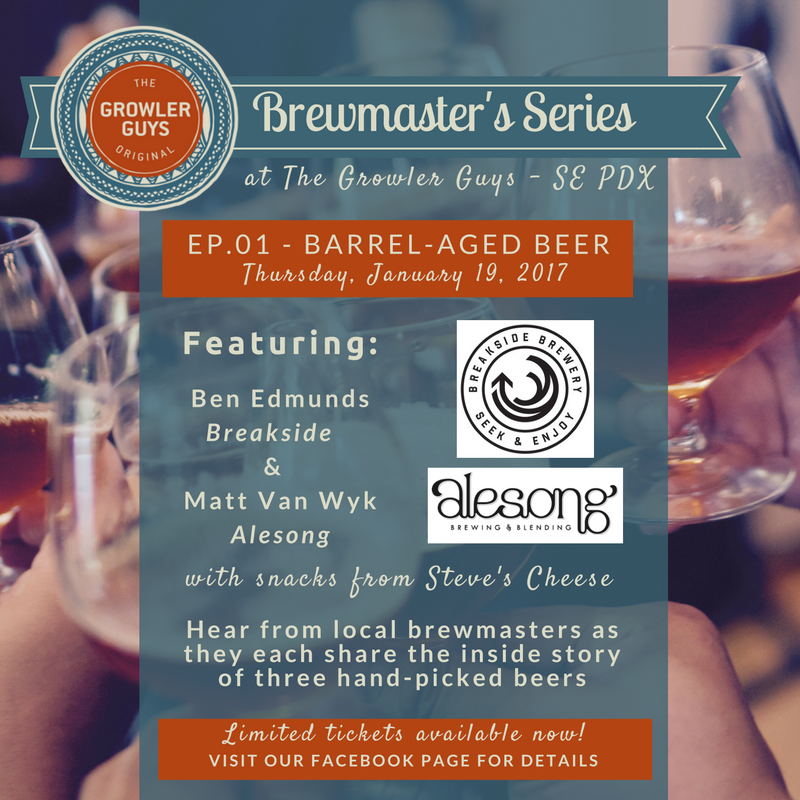 On Thursday, January 19th, Brewmaster’s Series EP.01 – Barrel-Aged Beer will take place featuring Matt Van Wyk from Alesong Brewing and Blending and Ben Edmunds. This two-hour session from 6:30 to 8:30pm will feature three beers from Van Wyk and his Alesong Brewing and Blending along with three beers from Edmunds. During this time attendees are said to have private access to Matt and Ben who will each offer and discuss three of their limited barrel-aged beers (5oz pours each). In addition to the beers there will be complimentary snacks of meats, cheeses and bread from Steve Jones of Cheese Bar. Tickets are limited and are available for $32.04 after service fees by clicking here. This ticket price includes 6 pours, 5 oz. each (30 ounces total). Shake Your Tree: American wild ale aged in oak barrels with peaches. Saison du Vin ’16: Farmhouse ale aged in oak and acacia barrels and conditioned with Muscat juice. Rhino Suit: Imperial milk stout aged in bourbon barrels. Fitzcarraldo: A blend of Belgian dark strong ale that spent over 18 months in Bourbon barrels, small portion of a Bourbon barrel-aged stout that had spent 12 months in barrels a dash of Toro Red, a smoky amber ale. Wunder Brett: Experimental blonde beer fermented 100% with Brettanomyces, conditioned on aged whole leaf hops, and blended with our Sour Golden ale.